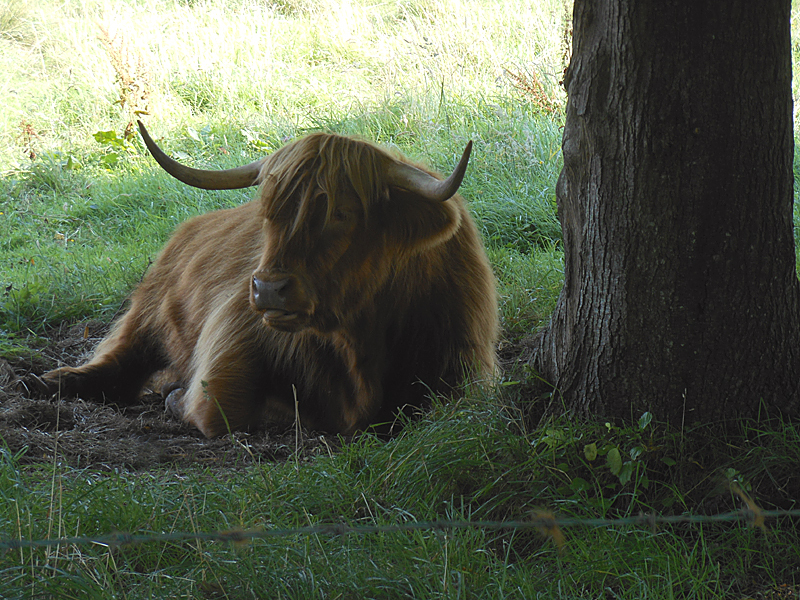 Highland cows keep watch at the entrance of the campsite. We already know them and they are quite friendly. Isn’t it great to find them at the doors of Edinburgh! 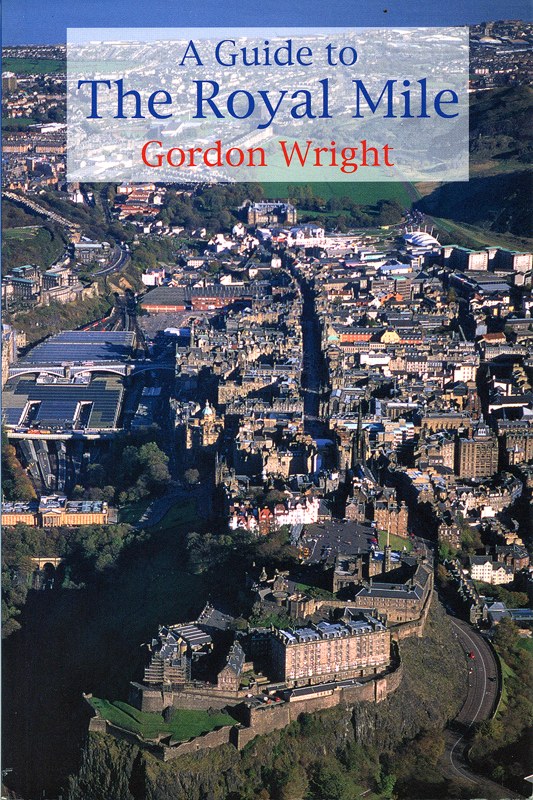 Now, with Gordon Wright’s wee book, A Guide to The Royal Mile, in our pocket, we are ready to begin a very exciting day in the Old Town of Edinburgh. WOW! In Edinburgh, the greatest concentration of historical interest lies in the stretch of the city which runs down the rocky ridge of land from the Castle to the Palace of Holyroodhouse. This is the Old Town of Edinburgh, the Royal Mile, which has often been compared to the skeleton of a herring, with the Castle the head, the Palace the tail, and the innumerable closes running off the street at right angles, the bones from the spine. 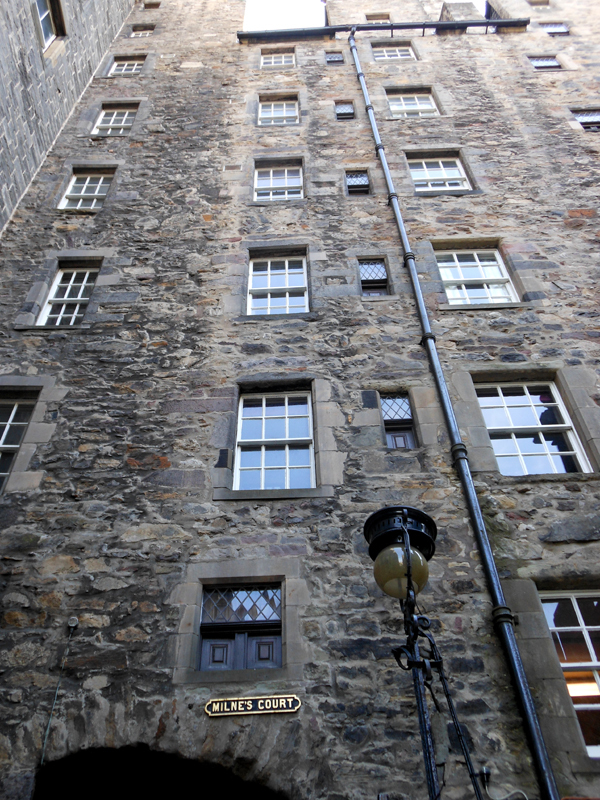 From top to bottom, the Royal Mile incorporates six different sections: the Castle Esplanade, Castlehill, Lawnmarket, High Street, Canongate, and Abbey Strand which leads into the Palace courtyard. ‘The mile’ is roughly divided at the junction of the North and South Bridge. This little guide is very popular and it has been re-edited a number of times. No wonder. Gordon Wright has lived here all his life. The few lines of introduction are very useful because they allow us to make at once a good idea of the place. 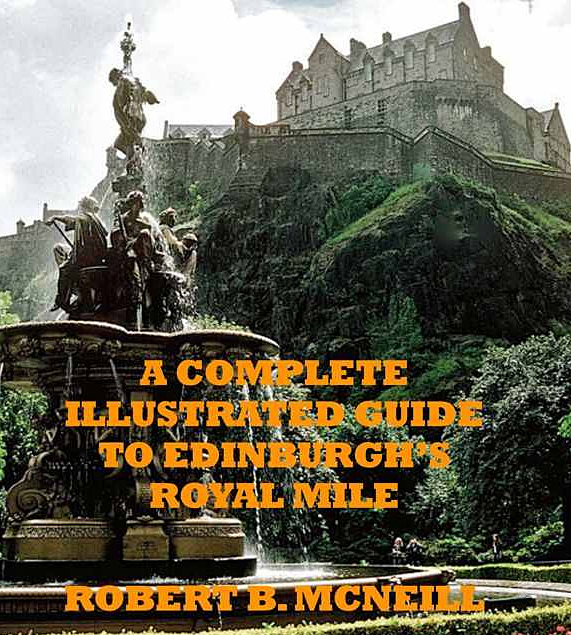 The magnificent photo on the cover is quite interesting too because we can see the whole of the Royal Mile from the Castle to Holyrood Palace. I’ve just uploaded this other little guide on my Kindle. Such format can also prove very convenient to visit a place and we will have it next time we go there. There are many illustrations and you may have recognized the Ross Fountain on the cover. 13:00 We finally find a place to park the car in George Street just in front of Laura Ashley store. But we’ll have to come back to put money in the parking meter. 14.00 We climb up Playfair Steps which lead through Milne’s Court from the Mound to Lawnmarket street in the Royal Mile. We are very happy to be back in the Old town at the foot of the old castle which we’ve already visited in a previous trip. 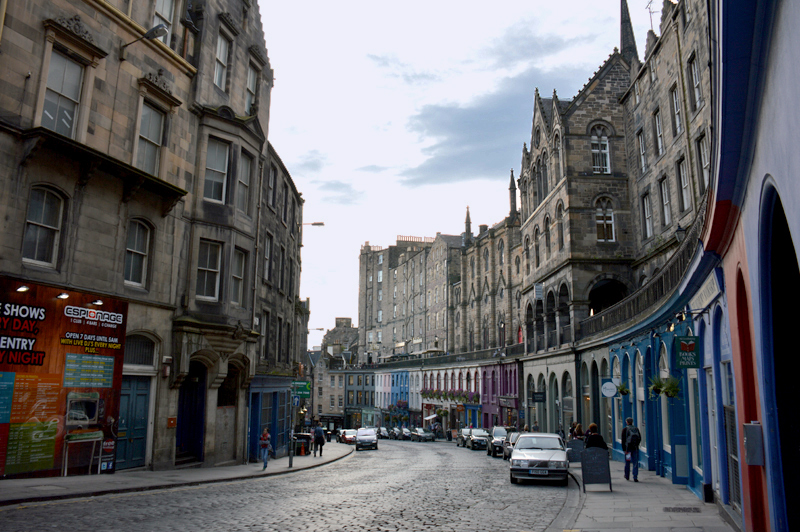 The Royal Mile is one of our favourite haunts in Edinburgh. We love the atmosphere of its lively streets, its picturesque old houses and historical buildings, its colourful shops (bookshops in particular) and the funny cabs which run up and down the Royal Mile from the Castle to Holyrood Palace. 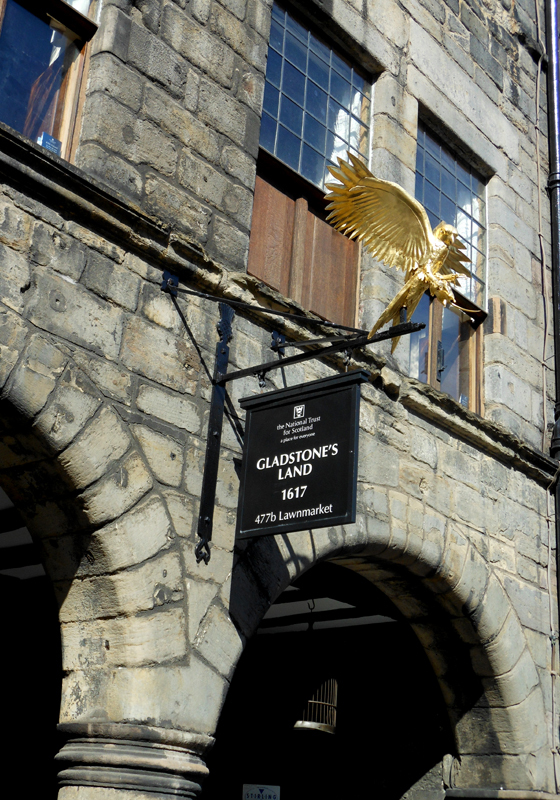 The sign above the entrance is surmounted by a golden eagle which holds a mouse in its claws. It has been designed and made by Douglas Campbell, the Trust’s architectural metal worker. The visit begins on the ground floor with the Cloth Merchant’s Booth. Here we are invited to touch beautiful rustic yarns and pieces of material reproduced after old documents and cloth. The lady who welcomes us here shows us an ‘ell-stick’, a ruler which was used in the olden times, in Scotland, to measure cloth. An ‘ell’ equals 37 inches which is about 94 cm. We also learn many interesting things about the traditional ways of dyeing cloth using vegetable dyes: bracken, gorse, heather, lichen, onion skins, madder and ragvort. Blue was made from imported indigo. There has been a renewed interest in these old and natural dyeing processes in the craft industry (knitting and weawing). 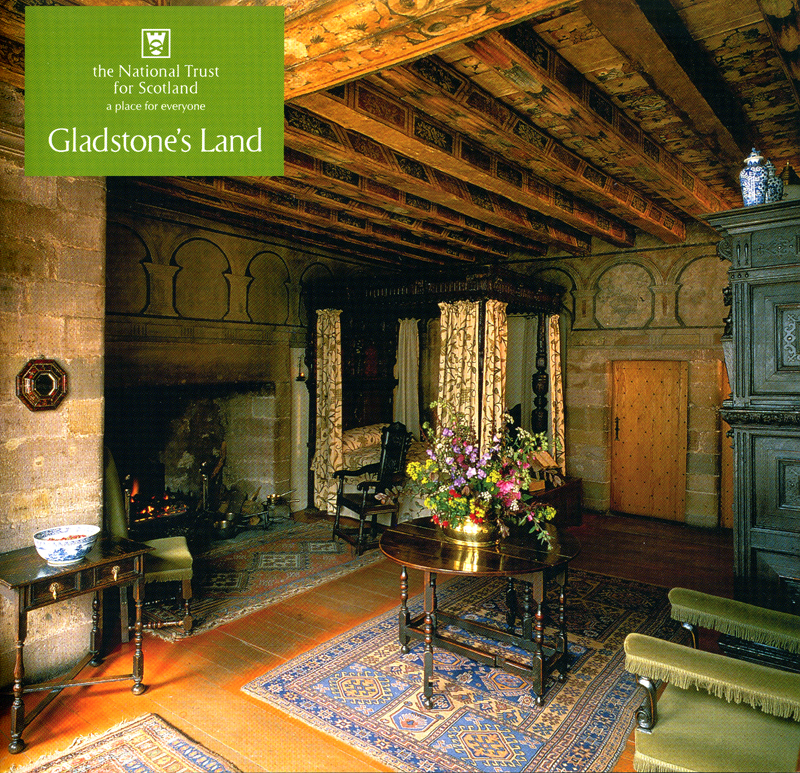 The old house is a lively museum, each room having been very beautifully restored and full of antique furniture. The painted ceilings and the wall paintings were discovered during the first restoration. 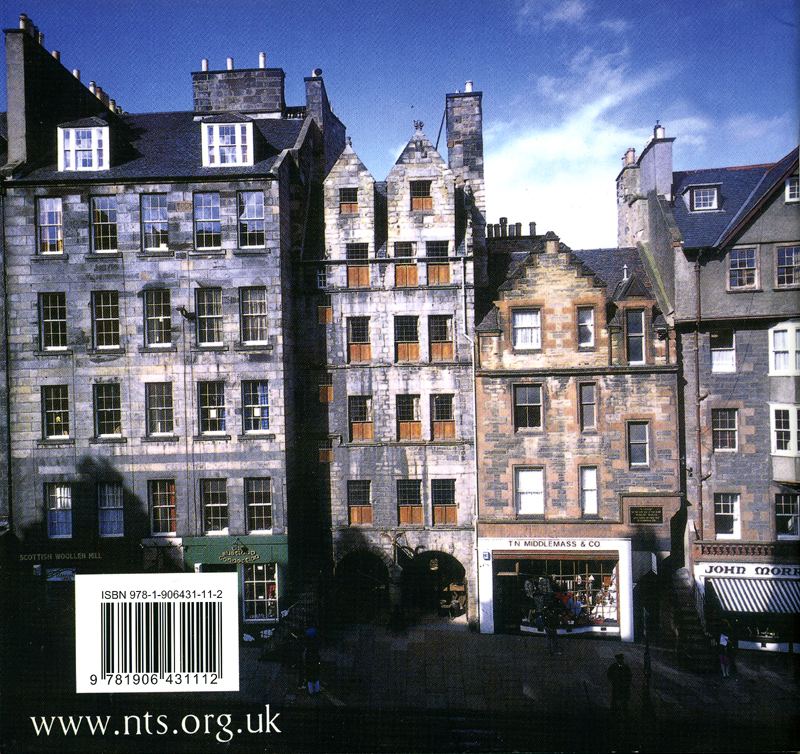 Just have a look at them on the cover of the NTS brochure! It’s magnificent! Don’t miss the visit if you happen to be in the area. We’ll probably go back there for there are many many more things to see. On either side of the King’s High Street plots of ground, called tenements, were bought by merchants and the buildings erected on them were known as lands. One of those was Gladstone’s Land. As the population expanded, pressure to build within the Royalty increased and the lands grew ever taller. By 1767 they had become so overcrowded, decayed and insanitary that the City Royalty was extended, and the New Town was begun on the open land to the north, beyond the Nor’Loch. In the early twentieth century Gladstone’s Land had become a slum dwelling, as had so much of the property in the Old Town. By the 1930s many of the once noble rooms had been subdivided, giving rise to severe overcrowding, and in 1934 the land was condemned to demolition. It was rescued by the National Trust for Scotland, who gradually bought the entire property for the sum of £762. 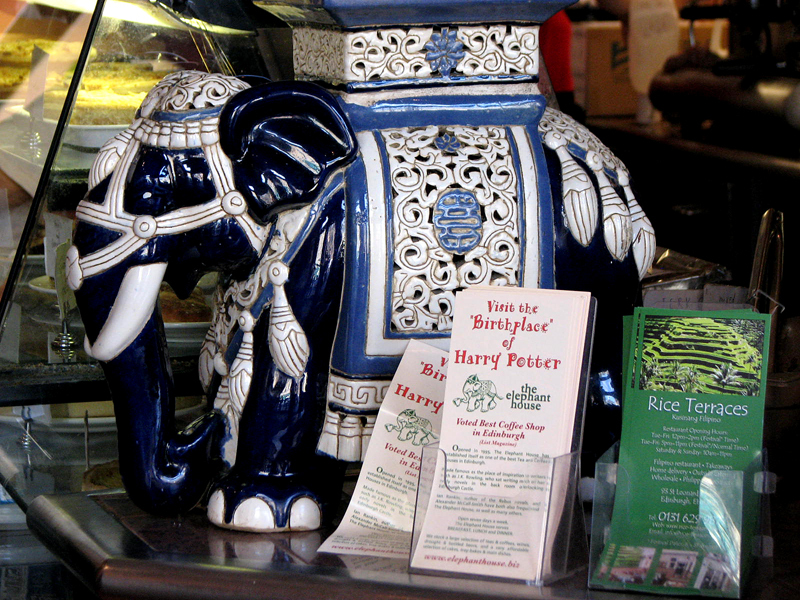 15:30 We stop in front of the Elephant House which is the birthplace of Harry Potter. 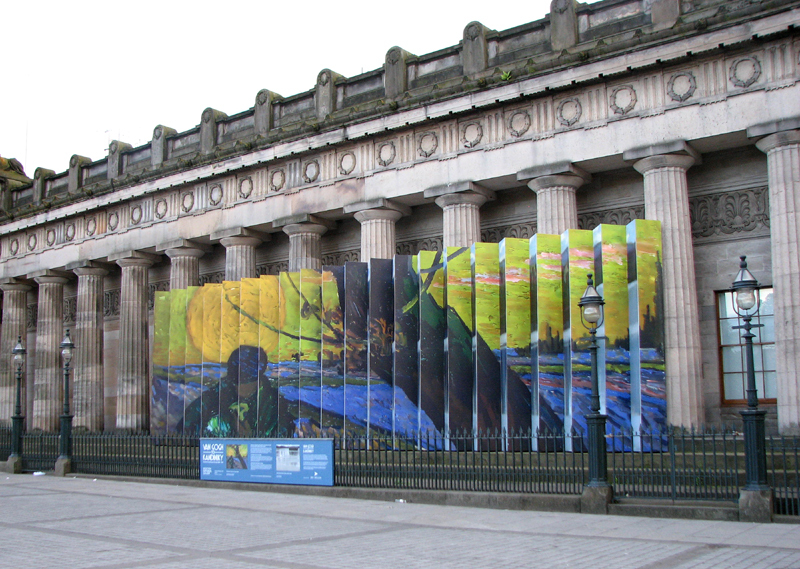 It is situated at 21 George IV Bridge and it has become a landmark for the tourist in Edinburgh. 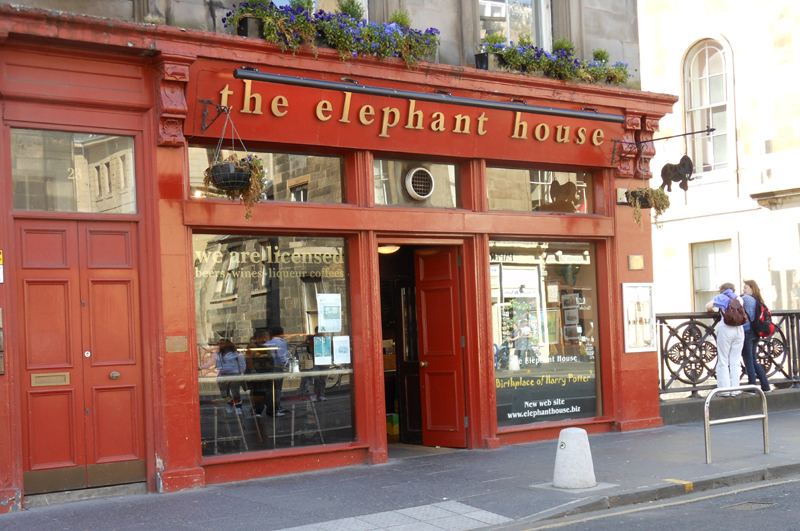 Ian Rankin, author of the bestselling Rebus novels, and Alexander McCall-Smith, author of The No.1 Ladies’ Detective Agency and other series of novels, have also frequented The Elephant House, as well as many others throughout the years. Experience the magic yourself. Visit us and savour a cup of tea or coffee before venturing out to explore historic Edinburgh. After watching J.K. Rowling on this video I felt like re-reading Harry Potter in the English version and I decided to download at once on my Kindle Harry Potter and the Philosopher’s Stone‘, the first volume in the series of eight. I like fantasy and Scotland has added many titles in the genre. It’s quite moving to listen J.K. Rowling, interviewed there, at The Elephant House, when she was writing the first adventures of Harry Potter. Her life is a great Scottish success story. 16:30 There is not much time left to take all the photos I wanted to take in the National Museum of Scotland: the famous Lewis chess game, Pictish engraved stones and artefacts (jewels mainly) and details of the painted ceilings. We’ll have to go back and stay there for several hours, not to say a whole day! 17:15 as Janice is desperately looking for wifi, we decide to go to Edinburgh Central Library which is situated at 7-9 George IV Bridge, directly opposite the National Library of Scotland. 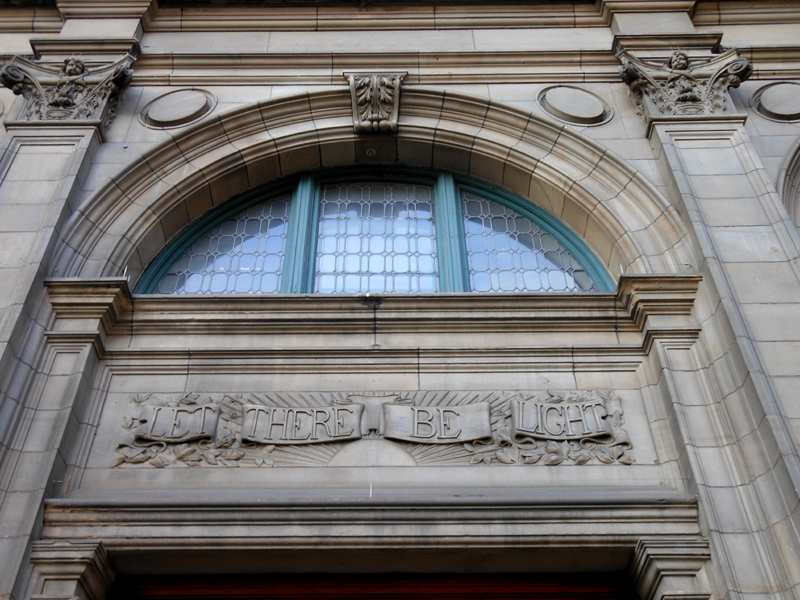 It is Edinburgh’s main public library and it shelters more than 850,000 items in its collections. As daylight is fading we stroll along the picturesque streets of the Old Town… Above is Victoria Street lined with lovely colourful shops. 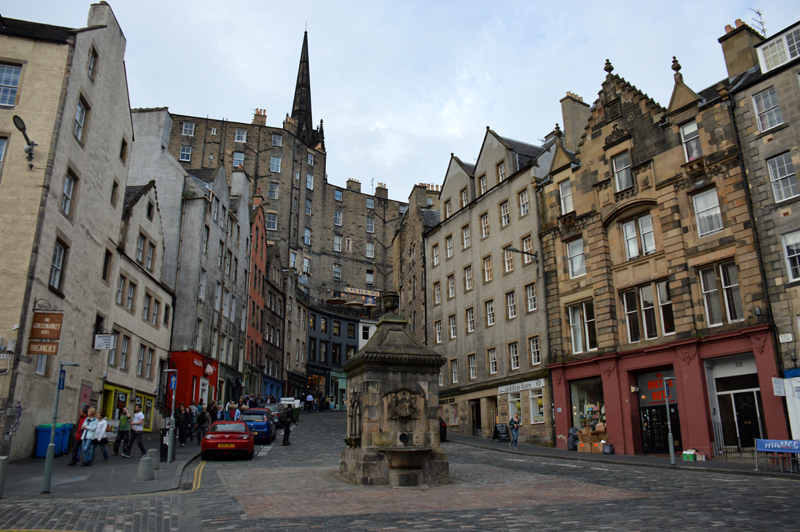 Grassmarket with Bowfoot Well, its emblematic old fountain dating back to 1674. 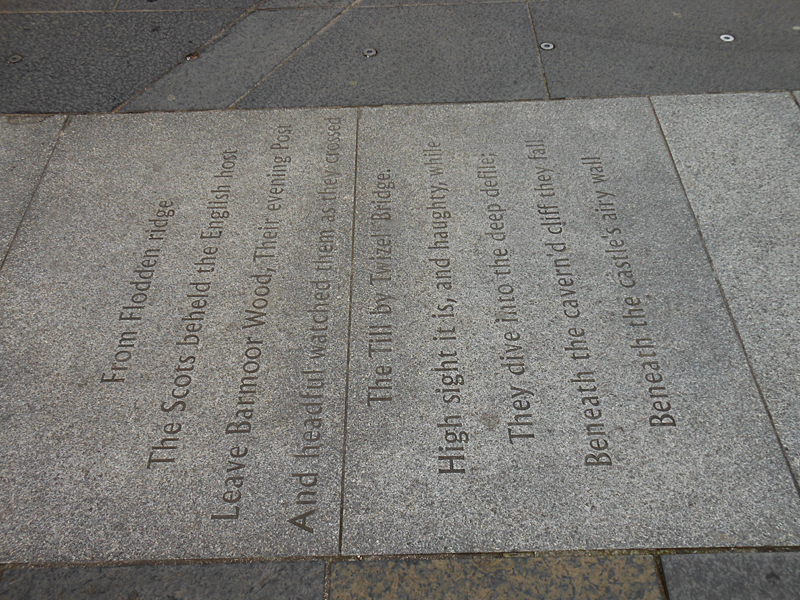 At the foot of Granny’s Green Steps which climb from Grassmarket to the old castle one can read, engraved on the paving, ‘Flodden‘, a famous poem written by Walter Scott . 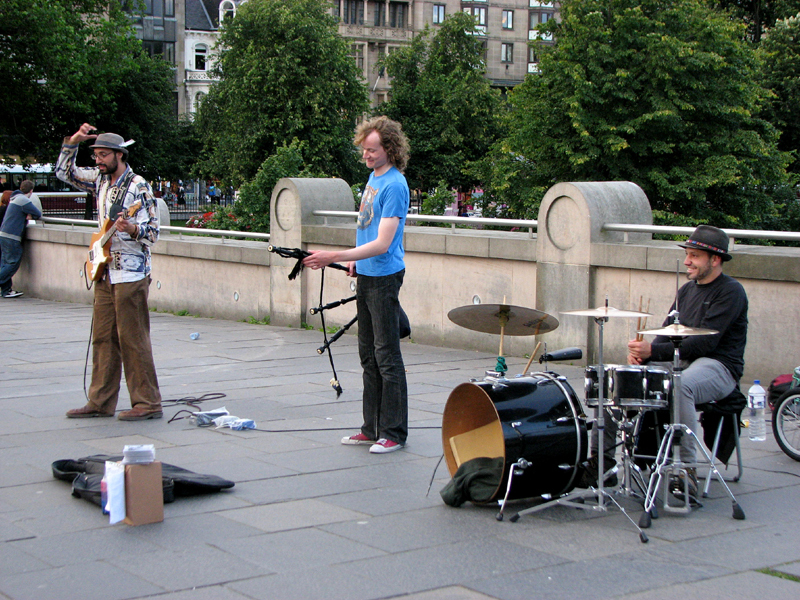 In front of the Scottish National Galleries where there is an exhibition titled ‘Van Gogh to Kandinsky’,we listen for a long time to a group of musicians. 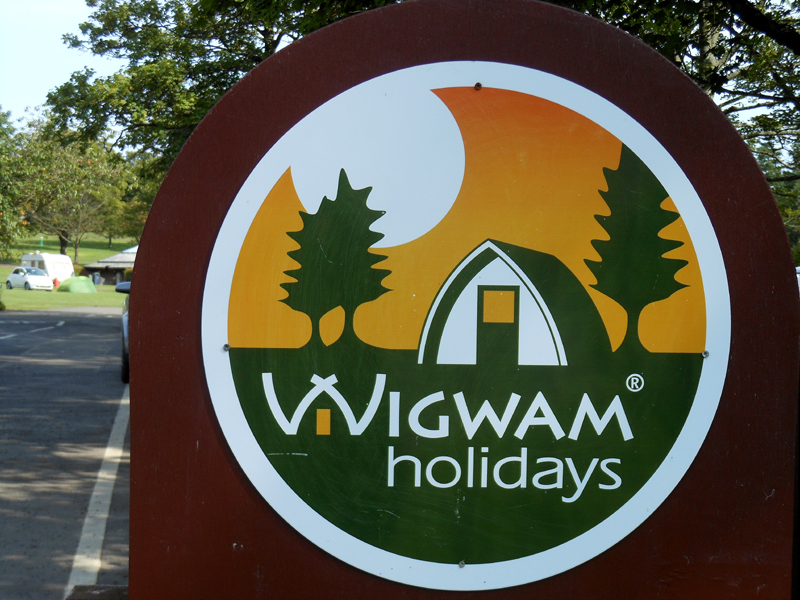 But now it’s time to go back ‘home’ in our wigwam at Mortonhall campsite. 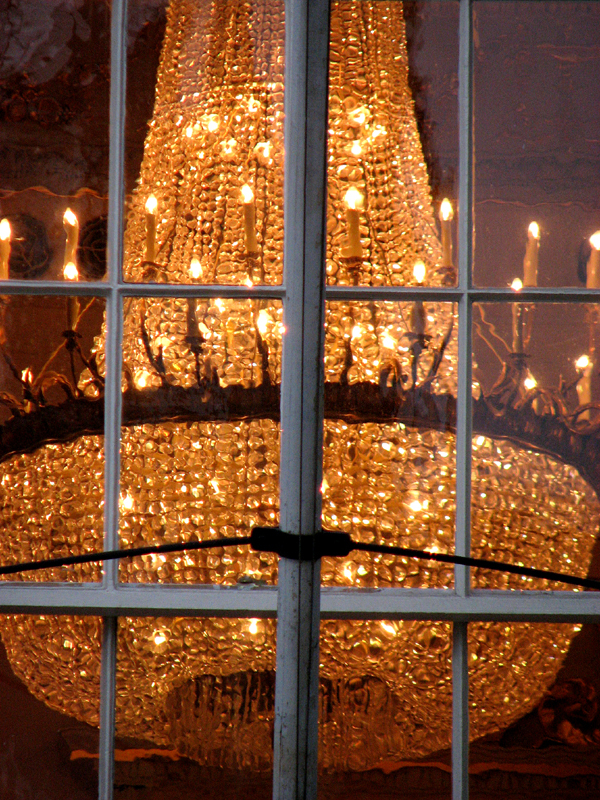 Night has fallen and before arriving to the car we can admire from the outside the magnificent candelabra illuminating the Assembly Rooms. Next time we’ll go to North Berwick on the East Lothian coast, and we will visit Dirleton Castle and Tantallon Castle. But we’ll have another day to spend in the Old Town before taking the road to the north.